For booksellers as sedentary as we are, it might seem surprising that books on sports and games would appeal to us. Many of you will already know about our golf and tennis lists, but what you probably didn't know is that we harbour a secret passion for such relatively unusual sports as croquet, lacrosse and polo. Many of the items have been illustrated. These images are linked through the descriptions below, or browse through them by checking the Sports and Games Image Gallery. So check the index below for your particular favorite! Durant, John and Bettmann, Otto. Pictorial History of American Sports: From Colonial Times To The Present. [New York]: A.S. Barnes and Company, 1952. [First edition]. A remarkable survey of American sports, covering both individual and team events, amateur and professional, competitions and championships, male and female; extensively illustrated with period drawings, engravings and photograps, as well as pictorial endpapers; includes such unusual sports as gander pulling, female boxing, long-distance swimming and walking. No. 34 of 160 copies signed by both authors. Original black buckram with gilt-lettered red leather spine, now just barely sunned; top edge gilt. Internally, tight and clean. Grey paper covered slipcase with large four color pictorial label; a touch rubbed and chipped at opening; lightly age-toned. A fine book in near fine slipcase. Hughes, C.E., with Buchanan, Fred. Sport in a Nutshell. London: Jarrolds, [n.d., 1921]. [First edition]. "By the late Colonel Bogey. Edited by C.E. Hughes and his unrivalled staff of assistants, namely Fred Buchanan." An odd little tongue-in-cheek look at sports and games, with cartoons (by Buchanan) and brief alphabetical entries (by Hughes). A fine copy in original four colour cartoon pictorial (carnival huckster) boards bright, but just a hint dusty; commercial ads inside covers, on flyleaf and on rear; contents excellent. Sample entry: "LAWN-TENNIS.- Lawn-tennis was invented by the Prince of Wales, whose motto, Ich dien, is believed to be the German for "I serve." The game was originally simple, but no one nowadays is considered to be any good at it who cannot do the American back-hand upper-cut half-nelson smash service with lift ..."
Peek, Hedley. The Poetry of Sport. London and Bombay: Longmans, Green, and Co., 1896. Large Paper edition, #240 of 250 copies. "The Badminton Library of Sports and Pastimes." A compendium of sports related poetry, mostly hunting, fishing and shooting, but not exclusively; with occasional in-text illustrations. Original 3/4 dark blue leather, with ochre cloth cover; gilt ruled, with decoration (Beaufort crest on front), and lettering on spine; leather lightly rubbed along bottom edges, joints and corners, and small scuff on spine; top edge gilt, others uncut. Large bookplate; endpapers perfect; light foxing, pages otherwise clean; bright blue ribbon marker. A fine, tight copy. Sports and Games : A Magazine of Amusements for All Seasons. Vol.2, no.2 (April, 1871). Boston: Adams & Co., 1871. Incomplete copy: contains front wrapper and text pp. 55-78 (text numbered through the volume, no.1 had pp. 1-54; lacks pp. 79-102). Pale yellow front wrapper (rear lacking), decoratively printed in black, now much chipped, soiled and worn; ink name at top front; binding thread gone; vertical crease; one leaf torn affecting a couple lines of text. In short, the world's worst copy of this little magazine, yet extremely uncommon! Contain sections on "Home Tableaux", "Indoor Plays", "Table Games" (Dominos) and "Outdoor Games". Published by the producer of popular Victorian parlour and board games. Wood, Rev. J.G. Athletic Sports and Recreations for Boys. London: Routledge, Warne, and Routledge, 1861. [First edition?]. "With One Hundred and Twenty-five Illustrations", most in-text, with two plates. November 1860 publisher's ads at rear. Original blue cloth, now soiled, spotted, rubbed and worn; gilt lettering on front and spine still surprisingly clear; small loss at spine ends and corners. Internally soiled and toned, with some gatherings protruding and bumped, yet block tight; short tear to front free endpaper, 3/4 of rear one neatly excised; bookseller's label on front pastedown; closed tear to margins of frontispiece and a couple other leaves - tooth mark indentations on lower edge of first few leaves might have been made by a dog, p.49/50 lacking small piece at lower margin (no loss); dampstain along lower edge of plates. A good, and complete, copy of this fascinating little book, covering much of a Victorian boy's sporting entertainments, obviously once well loved by a Victorian boy! "Comprising Cricket. Croquet. Lawn Billiards. Knock-'Em-Down. Aunt Sally. Gymnastics. Swimming. Skating. Archery. Fencing. Broadsword. Riding. Driving. Rowing. Sailing. etc. etc." Hay, Ian ([pseud.] Major-General John Hay Beith). The Royal Company of Archers, 1676-1951. Edinburgh and London: William Blackwood & Sons, 1951. [First edition]. Well illustrated with b/w photographic plates. Original forest-green cloth, spine lettering and cover rules and medallions (archer's motif on front and royal arms on rear) all in bright gilt; minor rubbing at corners, ¼" closed tear at head of spine; faint rippling along centre spine. Text clean and tight. A fine copy of this, the second history of the Company (the first having been published in the 1870s). Archers' Hall. 16 pp. booklet, plus glossy colour-pictorial wrappers and center insert. Contains list of Officers, A Brief Historical Survey by Ian Hay, and lists of the pictures and silver on display therein. [Announcement flyer for the book]. Blue perforated leaf with reservation slip at bottom. Report by the Adjutant On the Occasion of the Coronation Visit to Scotland ... 23rd to 29th June 1953. 36 pp. cream booklet, now lightly foxed and toned around edges of front; minor rumpling of fore edge. Near fine. Visit of the Woodmen of Arden to Edinburgh, June 1973 ... XXIXth Triennial Match ..., The Royal Company vs. the Woodmen. 10 cream stapled foolscap folio sheets, mimeographed; horizontal fold; hint of dusting to lower front. Lake, Fred and Wright, Hal. A Bibliography of Archery. Lyon, Mississippi: Derrydale Press, 1994. "Limited edition"*; one of 1250 copies, this one signed by Glenn St. Charles ("Commissioner of the Legends of the Longbow Library ..."), but not numbered. Original gilt pictorial ("Legends of the Longbow" archer) dark green rexene; all edges gilt; tiny 'ding' at centre rear. Contents excellent; archery endpapers. A fine copy. "An indexed catalogue of 5,000 articles, books, films, manuscripts, periodicals and theses on the use of the bow for hunting, war, and recreation, from the earliest times to the present day." * First published in 1974 (Manchester [UK]: Simon Archery Foundation). Payne-Gallwey, Sir Ralph. The Crossbow: Mediaeval and Modern, Military and Sporting. London: Holland Press, 1995. Tenth Impression (facsimile of 1903 edition). "Its Construction, History & Management, with a treatise on the Balista and Catapult of the Ancients, and an appendix on the catapult, balista & the turkish bow." Extensively illustrated throughout with historical and modern drawings showing the structure, operation and technical aspects of crossbows. Original gilt lettered black cloth; as new. Reddish-brown pictorial (crossbow) dust jacket, lettered and decorated in white. An exhaustive monograph - the sections on the catapult, ballista and trebuchet are particularly well illustrated! Butler, Guy. Running and Runners. London: Herbert Jenkins, 1938. First edition. Illustrated with several photographs of champion runners. Publisher's grass-green cloth, lettered and ruled in black; spine leaning slightly. Neat ink ownership inscription on front free endpaper; minor toning to first and last leaves; contents excellent. A fine copy. [----- Another copy]. This one lightly sunned on spine; front cover a bit splayed. Ink ownership name and date on front pastedown crossed out with another name added beneath; corner of half title creased in binding, and mis-cut as a result; top and fore edges a bit foxed; text block split at pp. 49-50, yet still firm. Near fine. Pash, H.F. (ed.). Fifty Years of Progress: 1880-1930. London: Amateur Athletic Association, . [Second edition]. "The Jubilee Souvenir of the Amateur Athletic Association." Illustrated with numerous photographs of members of the Association, of champions and of races. Amateur championship records and other statistics on pp. 136-173. Original gilt-lettered dark green cloth, bright and clean; a couple minor edge "dings"; top edge of front cover worn along 2". Minor bubbling to front pastedown; fore edge lightly foxed; contents nice and clean. A near fine copy. Foreword by Lord Desborough. "Editorial" dated April 24th, 1930; "Introduction to the Second Edition" dated December 1st, 1930. Webster, F.A.M. Athletics of To-day: History, Development and Training. London and New York: Frederick Warne & Co., 1929. [First edition]. "With Foreword by Lord Burghley. Over 300 Illustrations", photographic plates and in-text drawing Author's presentation inscription dated June 13th 1929 on front free endpaper. Original dark green cloth, lettered in black on front, gilt on spine with rules at ends now a touch rubbed; a few lightened spots on spine; covers, especially rear panel and front joint, lightly rubbed; corners and spine ends bumped, the forner a bit worn. Bookplate; front hinge cracked, yet holding firm; a few pages "thumbed", contents otherwise clean and tight. A very good copy. Bennett, Joseph. Billiards. London: Thos. de la Rue, 1894. Sixth edition. "Edited by 'Cavendish'." "With upwards of 200 illustrations", including detailed table diagrams and wonderful pictures of players showing their stances and attitudes. A fine and spectacularly bright copy, in original green cloth, elaborately gilt lettered and decorated (crossed cue and bridge with balls on spine, score board as title border on front); just a hint of creasing to spine ends, corners a touch frayed; fore and top edges foxed. Neat ink name and faint remnants of red pencilled number on front endpaper (number repeated on half title), hinges perfect; pin-point foxing to endpapers and first and last leaves; contents clean, tight and bright; 8 pp. publisher's book and stationery equipment ads and 1 pp. ad for "Billiards Thoroughly taught in Thirteen Private Lessons by Joseph Bennett, Retired Champion ..." at rear. Billiards Association and Control Council. The Rules of the Games of English Billiards, Pool, Pyramids, Snooker, Volunteer Snooker, and Russian Pool. London: the Association, 1924. "Reprinted, April, 1924." With embossed seal of the Association impressed on copyright page. Original dark green smooth cloth; with dull gilt lettering on front, and completely bronzed on spine; corners very lightly rubbed. Free endpapers browned; contents tight and clean. A near fine copy. Billiards Simplified; or, How to Make Breaks. London: Burroughes & Watts, [n.d., 1890?]*. Twentieth Thousand. Illustrated by 83 diagrams of the Actual Play of Cook, Bennett, Roberts, Peall, Mitchell, Taylor, and Diggle. Dark green cloth lettered and bordered in black; spine, already low contrast, darkened just enough to almost obscure titling; a few tiny white speckles at top edge; very minor rubbing affecting border. Minor foxing to leaves facing free endpaper, contents otherwise clean and tight, with only the lightest toning of pages. With single leaf ad for "John Roberts', Jun., Champion Cues, Burroughes & Watts" tipped on to front free endpaper; simply printed pale green leaf, now toned around perimeter, with minor chipping to right edge where it extends slightly beyond text block. All in all, a fine copy. * Date from British Library catalogue. Broadfoot, Major W. Billiards. London and Bombay: Longmans, Green, and Co., 1906. "New edition January 1906"; Badminton Library, small paper, deluxe binding. With numerous diagrams and figures of play, and eleven plates showing men and women (most in eleborate Victorian formal dress) at play. ¾ dark blue leather, over gilt-stamped (Beaufort crest) orange cloth; gilt lettering on spine dulled; leather a bit rubbed at edges, otherwise in unusually nice condition; cloth lightly soiled. First and last leaves browned, as usual, where in contact with endpapers; 1912 ownership name on verso of front free endpaper; a couple leaves roughly openend, some unopened (pp.365/6 with long marginal tear, not affecting text, from attempt to open); pp. 123/4 with short tear and resultant crease across top corner; pages clean and tight. A near fine copy. "With contributions by A.H. Boyd, Sydenham Dixon, W.J. Ford, Dudley T. Pontifex, Russel D. Walker & Reginald H.R. Rimington-Wilson. Illustrated by Lucien Davis, R.I., and from Photographs, also by numerous Diagrams and Figures." Clifford, W.G. Billiard Table Games for Tables of All Sizes. London: W. Foulsham & Co., [n.d., 1944]. "Revised edition". "Foulsham's 'New' Popular Handbooks", no. 25. "Printed in U.S.A." Near fine in original colour pictorial (table) wrappers, bright and clean; tiny closed edge tear at rear; minor rubbing at spine ends. Internally, pages much toned; ink stamp ("Murton, Newcastle") on half title. Good (but usually lacking) dust jacket matches front wrapper, with series list on rear; now much soiled and edgeworn, lacking many pieces; flaps detached but present. Date from the British Library catalogue. Clifford, W.G. How to Play and Win at Snooker. London: W. Foulsham & Co., [n.d., 1940s]. "Wartime Reprint". "Foulsham's 'New' Popular Handbooks ... Fully illustrated". Plain pale yellow light card wrappers printed in black; contents nice and clean; colour pictorial (snooker table) dust jacket nice and bright, though just a touch dusty; lower front corner creased. A near fine copy. [Ephemera]. Lancaster and District Open Billiard Championship. March, 1914. "Complete Programme, 2d. Each", with first and most of second round scores and best breaks printed in, all others and names of advancing players filled in by hand. With local newspaper clipping describing the championship round and naming the winner laid in. Heavy white card printed in black; dusty; corners bumped or creased. A very good programme from a British regional championship - the winner, Joseph Cunliffe of Preston. Fry, Sidney H. Billiards for Amateurs. London: Hodder and Stoughton, . [First edition]. "With a foreword by Bernard Darwin and contributions by Tom Newman ... Melbourne Inman ... Willie Smith ... [et al.] Illustrated by photographs by G.W. Beldam" and with numerous table diagrams. Original gilt-lettered green cloth now, sadly, extensively mildew stained resulting in a powdery surface. Internally clean and tight, with only a slight rippling of frontispiece and light foxing of preliminary and terminal pages. A binding copy. [Garno, Benjamin]. Modern Billiards: A Complete Text-Book of the Game ... New York: Brunswick-Balke-Collender Co., . New edition. "Fully illustrated With Plates and Engravings ..." Original putty grey cloth, elaborately bordered in black and decorated in gilt on front (player at table) and spine (titling, crossed cues and balls); some marks, especially on rear, yet still sharp and bright; very minor wear at corners and spine ends. Small mark to front flyleaf; contents clean and tight. A near fine copy of this work, by America's foremost early billiards historian. "Containing plain and practical instructions how to play and acquire skill at this scientific amusement ... showing two hundred and fifty Strokes, and the best methods of executing them, as practised by the leading players of the day." Includes a 150 page section of "Billiard Record: A Compendium of the More Important Public Contests, Match and Tournament, at Both Caroms and Pool" from 1854 to 1908. Inman, Melbourne. Billiards: How to Play and Win. London: W. Foulsham, [n.d., ca.1922]. "Introduction by S.A. Mussabini." "With 45 specially drawn diagrams" depicting stances, strokes or shots. Original green buckram, lettered in black; corners a touch frayed, spine ends a bit rubbed; narrow ¾" shallow scrape to front cover. A near fine copy of this instructional work by the reigning English champion of the 1910s. Inman, Melbourne. Billiards: How to Play and Win. London: W. Foulsham & Co., [n.d., 1940s]. "Foulsham's Cloth-bound Pocket Library ... Introduction by S.A. Mussabini. With 45 specially drawn diagrams". Original red textured boards, lettered in black; extremities rubbed, covers a bit dusty. Bookseller's label on front pastedown; marks on pp. 60-61 (from old rubber band?). Very good. Kentfield, Edwin. The Game of Billiards: Scientifically Explained, and Practically Set Forth ...* London: John Thurston, 1850. Fifth edition. "Published by the Proprietor ... at his Petrosian Billiard-table Manufactory ..." Illustrated with 93 full page instructional engraved plates, plus one in-text diagram, showing equipment and techniques of play; preceded by 56 pages of explanatory text (vi,1-50, 50*-51*,51-54); lacks the fold-out frontispiece (commonly removed for framing). Small folio, in original ¾ brown cloth lettered in gilt ("Kentfield on Billiards with Illustrations" on front "Kentfield's Game of Billiards" on spine); re-spined, with most of original (including lettering) laid down; boards much rubbed and soiled; lower front corner deeply creased; all corners bumped and worn, point at lower front blunted. Ink inscription on front endpaper; pages foxed and "thumbed"; professional repair to long tear at pp. 53/4. A very good copy of one of the most important early works on billiards and related games, by the man who reigned as "first player in the world" for more than twenty years. * Complete title reads: The Game of Billiards: Scientifically explained, and practically set forth, in a series of novel and extraordinary, but equally practical, strokes: and illustrated by numerous and appropriate diagrams. To which is added the rules and regulation which govern the numerous games as they are played at the present day in all the countries of Europe." All Three Volumes - Complete Set ! Levi, Riso. Billiards: The Strokes of the Game [Parts 1-3]. Manchester: Riso Levi, [n.d., 1907-16]*. [First editions]. Three vols., complete. Illustrated with over a thousand in-text diagrams and drawings, paginated and plates numbered consecutively throughout. Original gilt lettered and decorated (billiard table) dark greenish-grey (v.1) or very dark green (v.2 and 3) cloth, with minor rubbing to otherwise bright gilt; v.1 a touch sunned on spine, with corners bumped; very minor decoloured speckling of cloth along edges of v.2 and 3, more so on v.1. Occasional pencilled marginalia, mostly in v.1; v.1 with tipped in title page (as issued); crease to rear endpaper of v.2; contents otherwise clean and tight. A near fine (v.1) to fine (v. 2 and 3) set of this exhaustive review, by one of the foremost early 20th century British billiards writers. Newman, Tom. How to Play Billiards. London: Metuen & Co., 1923. First edition. "With four plates and fifty diagrams." Publisher's presentation copy, with ink stamp over imprint on title page. Original dark green cloth, blind-stamped on front, gilt on now darkened spine; a few small marks on covers; light wear at joints and spine ends; upper front corner creased. Endpapers, fore edge and a few pages a little dusty; contents nice and tight; 8 pp. publisher's catalogue dated "722" at rear. A very good copy of this instructional, by a six-time Professional Champion who went on to play in the first ever televised billiards game (1937). Richler, Mordecai. On Snooker. Toronto: Knopf Canada, 2001. First edition. Author's last book. Ritchie, Wallace. Billiards in Twelve Lessons. London: Burroughes & Watts, [n.d., ca.1911?]. [First edition?]. With six photo plates showing proper techniques, forty shot diagrams and several full-page ads for billiards products. Original black cloth with lettering and pictorial decoration (Edwardian couple playing) in red and green; light sunning around edges of rear; a couple of abrasions to front and bumping to corners; professionally re-spined. Endpapers a touch tanned; contents slightly age-toned, yet clean and tight. A very good copy of this very uncommon work. Not in the British Library, Oxford OLIS, or Library of Congress on-line catalogues. Other billiards works by the same author, such as Billiard Secrets or Billiards Simplified, are more readily found. Roberts, Charles. The Complete Billiard Player. London: Methuen & Co, 1921. Second edition, revised. "With a frontispiece and two hundred and forty-eight diagrams". Original green cloth, now a bit tanned on spine and lightly sunned at edges; blind-stamped on front, gilt on spine nice and bright; corners rubbed; small abrasion at front fore edge; spine ends worn with very minor loss; 1.5" reddish-brown mark along rear joint. Ink ownership name and date on front free endpaper; contents nice and clean; 8 pp. publisher's catalogue at rear, with 4 pp. "Autumn, 1921" list laid in. A very good copy. Roberts, John [Jr.]. Billiards for Beginners. London: Ward, Lock & Co., [n.d., ca.1914]*. Well illustrated with over forty shot diagrams; 2 pp. blank scoresheet at rear. Dark green cloth elaborately decorated (crossed cues with balls) in black, red and white, and lettered in white, all now a bit rubbed; rear cover lightly creased down centre; front at upper corner; faint and minor spotting; corners and spine ends a bit worn. Contents a bit thumbed, yet still clean and tight; advertising endpapers lightly age-toned, hinges perfect. A very good copy of this reprint of the classic work, collecting the author's articles for The Billiards Review. * Dated from ad at rear. Roberts, John [Jr.]. Billiards for Beginners. London: Ward, Lock & Co., [n.d., ca.1920s?]. Clearly a later edition, evidenced by cheaper paper, two-colour decoration on front (rather than three-colour), and breakdown of fonts. Extensively illustrated with dozens of shot diagrams; two page sample score sheet at rear. Original grass-green cloth with red and black decoration (crossed cues and balls); covers much spotted, with evidence of label removed from front panel; endpapers and text a touch toned; surface scuff from pp.42 adhered to pp. 43, affecting diagrams. Very good. A collection of Roberts's articles for The Billiard Review. Roberts, John [Jr.] "and others". Modern Billiards. London: C. Arthur Pearson, 1910. Third edition. "Edited by F.M. Hotine". Five pages of photographic plates, and hundreds of stroke diagrams throughout; seven leaves of billiards ads on front endpapers and what would otherwise have been blanks. Original dark green cloth bright and clean, gilt lettering and decoration on front and spine still nice and bright, black advertisement (sharp) on rear; a touch of rubbing at extremities and creasing at spine ends. Hotel library bookplate on front pastedown, ink stamps on rear pastedown, half title and title page; some foxing, especially to edges and leaves near plates; endpapers tanned; text block nice and tight. A near fine copy. With contributions, mostly breaks, by William Mitchell, Charles Dawson, H.W. Stevenson, William Spiller, W. Osborne and F. Bateman. Smith, Willie. Billiards in Easy Stages. London: Sir Isaac Pitman & Sons, 1946. Second edition, reprinted. "With seven photographs and twenty-five diagrams". Original green and black photopictorial (Smith playing) heavy card boards, with blue-green cloth spine; boards now rubbed and a bit dusty; corners bumped. Pages lightly age-toned, but clean and tight. Photopictorial dust jacket, matching boards, a touch dusty on rear; small chips at head of spine; a couple short closed tears, with with resultant creasing; light rubbing at or near joints. A very good copy of this book, by a champion who was considered by many to be the best player of his day. Smith, Willie. Match-Winning Billiards. London: Mills & Boon, 1924. First edition. "With seven photographs and eighty-five diagrams." Original dark blue cloth covers severely mildew stained, yet gilt lettering still nice and bright; spine unaffected; corners rubbed. Contents clean and tight; small pieces lacking from rear endpapers at lower gutter. Because of the covers, a very good copy only. [Vanity Fair prints]. Billiards. Updated as available. Armstrong, Walter. Wrestling. London: George Bell & Sons, 1889. [First edition]. "The All-England Series". 9 pp. ads, including endpapers, preliminary and final leaves. Original reddish-brown cloth lettered and decorated (the inside click) in black; now rubbed at extremities, and a bit soiled overall. Internally a bit loose, but stitching holding well; pink ink scribbles (pen test?) on pp.50; lower portion of pp.9/10 cracked but not split; "thumbing" to some leaves. A very good copy. Donnelly, Ned. Self-Defence; or, The Art of Boxing. London: Weldon & Co., *. [First edition]. "With Illustrations, showing the various blows, stops, and guards. ... Edited by J. M. Waite ..." Original dark green cloth, bordered in black, lettered and decorated (prize fighter) in gilt; with 1/4" square graze on front cover affecting nose of figure; cloth lightly soiled, but all gilt nice and bright; small 'ding' at top front; corners lightly worn. Pages age-toned, and several dusty, thumbed or marked. Still, a very good copy. * Preface dated 1st January 1879. Henning, Fred. Fights for the Championship: The Men and Their Times. London: "Licensed Victualler's Gazette" Office, [n.d., 1900?]*. 2 volumes. Illustrated with many in-text engravings of the champions and their bouts. Original red cloth, lettered and ruled in gilt on spines, ruled in grey on covers; spines sunned. Vol.1 now soiled overall, with a few light spots and white scrapes on rear; rubbed streak to spine. Vol.2 cloth dusty and a touch sunned at top. Bookseller's labels on front pastedowns; blocks clean and tight. Vol.1 very good, vol.2 near fine. * The lists of Championship fights ends in 1889, the date of the last championship under London Prize Ring rules. British Library dates this as "(1900)", the Bodleian Library as ""
"Cavendish" [pseud. Jones, Henry]. Patience Games with Examples Played Through. London: Thos. de la Rue, 1890. [First edition]. "Illustrated with numerous diagrams" and printed in red and black throughout, with detailed descriptions of the games and their solutions. Oblong volume in original terra-cotta coloured cloth, decoratively ruled in brown; lettered on front and spine in gilt, with publisher's device on rear; all edges gilt; corners and spine ends rubbed with a bit of loss; evenly but lightly soiled overall, and with a bit of rubbing here and there. Endpapers tanned; decorative pages (verso of half title and recto of frontis) toned where clipping had been laid in; contents clean, tight and supple. Overall, a very good copy of this attractively designed book. [----- Another copy]. This one soiled around edges of covers, with rough repair to rear joint; internally bright, tight and clean. Very good. Hoffmann, Professor [Lewis, Angelo John]. The Illustrated Book of Patience Games. London: George Routledge & Sons, 1907. Sixth edition. "Translated and edited by Professor Hoffmann." Printed in red and black, with patience game layouts throughout. Original grey-blue cloth, lettered and decorated (card layout) in red and black, with gilt lettering on spine; now lightly and evenly soiled overall; a bit of rubbing to corners. Contents lightly foxed, but generally clean and tight. A near fine copy. "Perseverance" [pseud. Cremer, Willam Henry]. Patience. London: E.C. Spurin, 1860. [First edition]. 28 patience/solitaire game descriptions and 28 full-colour chromolithographic card-layout plates. * Original decoratively gilt-titled, elaborately blind-stamped dark blue cloth; professionally re-cased, original spine laid down; cloth a bit rubbed, gilt still nice and bright on front, though all but gone on spine; all edges gilt. Text block now very tight; ink ownership inscription on verso of plate 1; archival tape repair to verso of leaf 19. A very good, attractive copy of this work on solo card games, one of the earliest in the English language. * Plates consist of frontispiece and 27 plates, each of the latter facing the game it illustrates; one game not illustrated (#20 - "Rifle Corps ... No Picture."). Bolton, Geoffrey. History of the O.U.C.C. Oxford: [Privately printed] at the Holywell Press, 1962. [First edition]. Illustrated with images of Oxford cricket greats, past and present. Original dark blue boards, lettered in silver on spine, with a few barely visible faint smudges on front; top of spine creased near rear joint; minor foxing to edges. Contents excellent. Publisher's glassine chipped at corners and spine ends; edges creased, especially top rear. A fine copy of the first history of the Oxford University Cricket Club (cf. foreword). Caple, S. Canynge. England v New Zealand, 1902-1949: A Brief History of Cricket Between the Two Countries. Falmouth [UK]:Barcliff Advertising and Publishing Co., [n.d., ca. 1950]. [First edition]. Original dull green pictorial wrappers, a little browned at margins. Pages browned, owing to poor quality of paper; a few nice full-page photographic plates. A near fine copy of a fragile item. Lyttelton, E. Cricket. London: George Bell & Sons, 1890. [First edition]. "The All-England Series". Illustrated with several photographs; cricket and related advertisements on endpapers and eleven other pages. Publisher's dull-green cloth, lettered and decorated (batsman and bowler) in brown; lettering on spine rubbed; a few tiny scuffs to front, light rubbing at extremities; creased at top spine corner; some bubbling to cloth on rear. Leaves a touch age-toned, especially free endpapers; 4 pp. folder of "The All-England" and "The Club" series of books laid in between pp.36 and 37, with resultant tanning of pages; text block cracked in a couple places, yet holding firmly. A very good copy. The Marlboro' [Cricket] Club (Crisp & Co.). Programme of Annual Smoking Concert ... April 4th, 1891. 51/8" x 8"; 3pp. cream coloured paper printed in brown on outside with decorative border and pictorial (cricket and sailing vignettes); pale pink on inside; very light foxing and edge soiling; single horizontal crease. Fine. March, Russell. The Cricketers of Vanity Fair. Exeter, England: Webb & Bower, 1982. [First edition]..
Putney Early Closing Cricket Club. Smoking Concert ... November 21st, 1889. 51/8" x 8"; 4 pp. light blue paper printed in black, with scalloped border; cross creasing, with pinhole at top. Ink note ("8:45 - 11:15") at bottom of front and extensive notes concerning the programme inside. Near fine. Ranjitsinhji, K.S. The Jubilee Book of Cricket. Edinburgh and London: William Blackwood and Sons, 1898. Sixth edition. Profusely illustrated with many in-text diagrams, and over a hundred photographs of well-known players, most in action. Original blue cloth, brightly lettered in gilt on spine, the latter now-darkened and showing original colour where small label was removed at base; covers a touch dusty; small "dings" to lower rear edge and upper front corner; spine ends creased. Internally clean and tight. Ex-library copy, with markings (bookplates on front pastedown; blind-stamps to title page and p. 57/8; date due stamps to rear pastedown. Despite the library markings, a near fine copy. Croquet: Rules & Regulations with instructions. East Barnet, Vermont: Wendell P. Roy*, [n.d.]. "American Edition". 16 pp. stapled booklet, plus black on cream decoratively ruled wrappers, with diagram of ground layout inside front cover. Staples rusting; very minor dusting. A fine copy. * Presumably one of the "Roy Brothers", a major early 20th century manufacturer of croquet sets. Most recorded copies of this rule book, thought to have been first published in 1911, bear the imprint "Roy Brothers" not "Wendell P. Roy" (see Drazin). Drazin, David H. Croquet: A Bibliography: Specialist Books and Pamphlets Complete to 1997. New Castle, DE: Oak Knoll Press; Winchester, Hampshire: St. Paul's Bibliographies, 2000. First edition. A fine copy in original blue boards, lettered in silver on spine; blue on white pictorial (woman player) dust jacket. A comprehensive bibliography covering books, pamphlets and related patents. Herrick, George G. (comp.). The Match Game: A Croquet Anthology. Washington, DC: The Author, 1999. [First edition]. Edition limited to 100 copies; this one signed by the compiler. The first anthology of the literature of croquet. Original bright green "leatherette" boards, richly lettered and decorated (equipment vignette) in gilt. As new. Rules for Playing Lawn Croquet with the Skowhegan Line Croquet Sets. Skowhegan, Maine: North Anson Reel Company, [n.d., ca.1970]. Abridged reprint of a 1930s rules first published for the South Bend Toy Company (see David Drazin's on-line Checklist ... 2005 update). 4 pp. white glossy folder printed in red and blue; rough horizontal fold; very light dusting. Near fine. Smith, Nicky. Queen of Games: A History of Croquet. London: Weidenfeld and Nicolson, 1991. First edition. A fine copy in gilt-lettered green boards; with fine pictorial (turn-of-the-century match) full-colour dust jacket. Author is "Arthur Mallet", a regular contributor on croquet to The Financial Times and Country Life. [Spalding's Athletic Library]. Croquet: Rules of the Game. New York: American Sports Publishing Co., 1927. 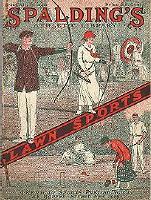 Spalding's Athletic Library, No.119R; extracted from Spalding's Athletic Library, n.43R, Lawn Sports. Illustrated with diagrams; 1 p. illustrated croquet equipment ad at rear. Original red and white wrappers printed in green, a little rubbed at spine and edges; contents clean and tight. A very good copy. [Ephemera - Advertising Flyer]. Roy Brothers. Croquet Sets - Roy Bros. East Barnet. Vermont: Roy Bros., [n.d.]. 4 pp. pictorial advertising flyer, with off-centre fold, showing 23 different 4, 6 and 8-ball sets manufactured by the company; printed in brown on yellow on outside, royal on light blue on inside. Horizontal folds a touch rubbed, just a hint of off-setting. Fine. Roy Brothers manufactured croquet sets throughout the first half of the 20th century, and was one of the largest producers in the 1920s and 30s. [Ephemera - Advertising Flyer]. Wrinch & Sons. Croquet Sets in Boxes. Ipswich [England]: Wrinch & Sons, [ca.1906]. 2 pp. flyer, printed in black on now evenly toned buff paper; one side listing eight sets for sale, the other advertising the "New Match Tournament 'Gold Medal" Croquet Set"; each side with woodcut. Vertical crease. tipped on 1 pp. red on white half-sheet, dated 25th May, 1906, stating "All the goods ... In Stock ..."; a touch age-toned; corresponding vertical crease; corner bumped. Both items near fine, nice and crisp. [Ephemera - engraving]. Croquet at the Convalescent Home of St. Bartholomew's Hospital, Highgate. From The Illustrated London News, September 27, 1873. Approx 16" x 11" wood engraving of men playing the game surrounded by amputees with crutches, men in wheelchairs or with bandages; signed "M.F." and "W.B. Gardner Sr." along bottom edge. A fine sheet, bright and clean. Brown's and St. George's Cycling Club. Smoking Concert ... December 21, 1892. 51/4" x 8"; 3 pp. rose coloured paper printed in blue ink, with decorative pictorial border; cross creased, with 1/2" closed tear at spine; a few pencil and ink notes inside; half of rear panel lightly soiled. Near fine. Brown's and St. George's Cycling Club. Smoking Concert ... February 10th, 1893.. 5" x 71/4"; 3pp. light salmon paper printed in black; with decorative and pictorial border; two horizontal creases with very short tears at ends; a bit soiled on blank rear panel. Very good. [Ephemera - cigarette card album] John Player & Sons. Cycling: 1839-1939. [U.K.]: John Player & Sons, [n.d., 1939]. Album no.12023 completed with all 50 cards affixed to information filled pages. Pictorial (cyclists' parade) two-colour wrappers, now lightly foxed and somewhat dusty, yet still nice and sharp; staples rusting; corners a bit bumped; minor "thumbing". A very good copy. A history of bicycles and bicycle types, including early tricycles, tandems and velocipedes, as presented in the popular British collectable cigarette card format. [Ephemera - prospectus]. "Save time, money, energy by riding on a Raynal Auto". Birmingham: Raynal Manufacturing Co., [1934?] Cream four-panel folder, with full-page centre spread, printed in green and black, advertising "Raynal Auto, The Power Assisted Bicycle", de-luxe and popular models; a few short closed tears at folds and a touch of toning; small "1934" in ink on front panel; near fine. Wilson, Marguerite. Dancing: A Complete Instructor and Guide to All the New and Standard Dances .... Philadelphia: Penn Publishing Company, 1899. [First edition]. "... With a full list of calls for all the square dances, The necessary music for each figure, etetiquette of the dances, and one hundred figures for the Germans ... With numerous illustrations [full-page and in-text] by Nina G. Barlow." Original dark moss-green cloth, lettered in red and decoratively bordered in silver; cloth somewhat worn at corners and spine ends; covers rubbed, especially affecting joints and silvering; titling on spine virtually gone. Ex-library, with evidence of label removed at spine, and the usual internal markings ("withdrawn" label over bookplate; small blind-stamp on title page and pp.55, ink number on copyright page; date due slip at rear and rear pastedown stamped with dates). Lacks front free endpaper; text loose, yet still holding well. A good copy only, but uncommon in the first edition. Covers most of the popular late Victorian steps, including square dances, contra-dances, cotillions, round dances, etc. Blake, W.H. In a Fishing Country. Toronto: The Macmillan Company of Canada, 1922. First edition. With chapters on fishing at Old Murray Bay and Lac Emmuraillé, and on the Brook Trout. Original mottled light brown cloth, lettered in brown just a touch lightened on front panel. Minor dampstain affecting upper corner of about twenty leaves; contents otherwise clean and tight. Scarce cream dust jacket printed in red, now lacking several large pieces and with closed tears and resulting creases; spine and one spot of front panel dampmarked, both panels dusty; on the bright side, it's present! A near fine copy in very good dust jacket. [----- Another copy]. This one without the dust jacket; bright and clean; with just a hint of fading to spine. Contents clean, tight and bright. A fine copy. Grey, Zane. Tales of the Angler's Eldorado. New York and London: Harper & Brothers, 1926. First edition. "With over 100 illustrations from photographs taken by the author and from drawings by Frank E. Phares". Original dark blue cloth, lettered in gilt on front and spine, and with publisher's device blindstamped at lower front; spine now lightly dulled, especially the gilt and at tail; a couple small, faint marks to covers. Text nice and clean; 1/2 split to front inner hinge. A very good copy of an angling and sport-fishing classic. A companion to the author's Trout Fishing. Simeon, Cornwall. Stray Notes on Fishing and Natural History. Cambridge: Macmillan and Co., 1860. [First edition]. Illustrated with frontispiece, title vignette and several in-text figures. Publisher's gilt-decorated (dog and fish) terra-cotta cloth, now much darkened on spine; corners lightly bumped, spine ends a bit worn, with short resultant tears; gilt still bright, especially on front. Hinges cracking, yet holding strong; a couple pencilled names/notes on front free endpaper; opened pages a touch frayed along fore-edge; one gathering re-inserted. 24 pp. publisher's catalogue dated "12.6.60" bound in at rear. A very good copy of this attractive and, with contents both on angling and on the animal world, curiously binary little book. [Fishing and Angling]. [Vanity Fair prints]. Fishing. Updated as available. Beckford, Peter. Thoughts on Hunting: In a Series of Familiar Letters. Toronto: Musson Book Company, . Canadian issue of the London, Hodder and Stoughton, edition, "with Illustrations by G. Denholm Armour and Introduction by E.D. Cuming". Full colour plates tipped onto grey leaves, with titled tissues. Large format, gilt decorated (hounds) and lettered bright red cloth, now somewhat sunned and dulled on spine, with cloth rubbed through at tail; light streak along spine of rear cover; both boards a bit dusty. Ink name and date on front endpaper; text clean and tight. A very good copy of this 20th century take on the 18th century classic. Brooke, Geoffrey. 'Alice' & 'Combined Training': A Tale of Two Horses. London: Seeley Service & Co., *. [First edition]. Original mustard-brown boards, printed in black on spine; faint diagonal line across rear panel (paper fault); internally excellent. Dust jacket with pictorial vignette (the horses) on front, printed in mustard and brown; now somewhat dusty, especially on rear panel; two light "drops" on or near spine; light creasing with a couple chips at head of spine. A fine volume in near fine dust jacket. La Guérinière, François Robichon de. Élémens de Cavalerie ... Paris: la Compagnie des Libraires, 1768. Nouvelle edition. "Contenant la connoissance du Cheval, l'Embouchure, la Ferrure, la Selle, &c. avec un Traité du Haras ..." 3 parts in 2 vols. (v.1, parts.1&2; v.2, part 3); with four folding engraved plates for part 2, bound into vol.2 instead. Contemporary sprinkled calf; gilt decorated compartmented spine, with reddish-brown title and golden-brown volume labels; calf at top of spines lacking on both vols, headband from vol.2 only; some rubbing at edges, and along spine of vol.2; all edges red. Internally clean and tight; silk markers present; marbled endpapers. A near fine copy of this classic on the training of horses and on dressage. La Guérinière was Equerry to King Louis XV of France. Halpin, Warren T. Hoofbeats: Drawings and Comments. Philadelphia and New York; London: J.B. Lippincott Company, 1938. [First edition], "limited to 1550 copies of which 1500 are for sale, this copy is No.214". "Introductions, Polo by Stewart B. Inglehart, Hunting by Henry G. Vaughan, Steeplechasing by William du Pont, Jr." A book of 65 full-page horsemanship plates, with accompanying text and small vignettes. Original white cloth, with blue and red windowpane-check pattern, and gilt lettered and decorated labels (onlaid on spine, printed on front); cloth a touch dusty. Endpapers lightly foxed; a couple pages lightly "thumbed". Accompanied by remnants of the original box, broken and lacking several side panels, but with decorated top and plain bottom ones still present; now soiled and worn overall. A fine volume in good box, proving the box did its protective job. Hayes, M. Horace. Stable Management and Exercise: A Book for Horse-Owners and Students. London: Hurst and Blackett, [n.d., 1909]. Second edition, revised and enlarged. Illustrated with 62 photographs. Rust-brown cloth, gilt lettered; corners and spine ends rubbed and worn; 1" repair at top front hinge, 1/4" at bottom; covers lightly soiled, 1" fading along fore-edge of rear cover. Ink name on front endpaper; pages clean and tight. A very good copy. March, Russell. The Jockeys of Vanity Fair. Tunbridge Wells: March Publications, 1985. [First edition]..
"Sabretache" [i.e. Barrow, Albert Stewart]. A Gentleman and His Hounds. London: Eyre and Spottiswoode, 1935. [First edition]. Nicely illustrated with b/w photographs of M.F.H. A stunning copy in the original gilt lettered scarlet cloth with minor fading to 2" of red-stained top edge near hinge; spectacular pictorial (fox hunter surrounded by hounds) dust jacket. Suffolk and Berkshire, Earl of [et al.]. Racing and Steeplechasing. Racing by the Earl of Suffolk and Berkshire, and W.G. Craven ... Steeple-Chasing by Arthur Coventry and Alfred E.T. Watson. London: Longmans, Green, 1893. Fourth edition, thoroughly revised. "The Badminton Library of Sports and Pastimes", with numerous illustrations by J. Sturgess. Original decorated brown cloth (usual Badminton Library design), lettered in black, white and gilt, now a bit dulled; corners lightly rubbed, spine worn at base and a touch darkened. Ink name and address on front endpaper; front hinge cracked and closed tear to last page of index, text otherwise tight and clean. A very good copy. Trollope, Anthony. Hunting Sketches. London: Chapman and Hall, 1865. [First edition]. [Ephemera - Race announcement]. Province of Quebec Turf Club, Entries for the Dominion Stakes [1887?]. Announcement of the race conditions and prizes, with entries for 1885 and 1886 listed. Lightweight cream leaf printed in black, folded in six; outer panels tanned and foxed on rear, showing through lightly on front; 1" closed tear at lower left fold. Very good. [Vanity Fair prints]. Coaching and riding. Updated as available. [Vanity Fair prints]. Field Sports & Hunting (both sport and fox). Updated as available. [Vanity Fair prints]. Horse Racing and the Turf. Updated as available. Clark, Ronald. The Victorian Mountaineers. London: Batsford, 1953. First edition. 43 sepia-toned photographic images; chapter titles include "The Scientists", "The Clergy" and "The Women". A fine copy in original black-lettered red boards; sea-green, price-clipped, pictorial (party on mountainside) dust jacket a trifle sunned. Discreet ink name on front endpaper; edges very lightly foxed. "The Party Crossing the Glacier des Bossons." "Above the Grand Plateau - A Large Crevasse." "Accident Near the Glacier de Tacounag." "The Summit of Mont Blanc, Seen from Below the Rocher Rouge." "The Grand Mulets. - Evening View." "The Aiguilles Sans Nom, Seen from Below the Rocher Rouge." Jackson, Monica and Stark, Elizabeth. Tents in the Clouds: The First Women's Himalayan Expedition. Collins: St James's Place, 1956. [First edition]. Extensively illustrated with b/w photographs, and maps. Original gilt-lettered black boards, lightly bumped at top rear corners; internally clean and tight. Four colour pictorial (woman facing mountains) dust jacket with light crease at top rear corners matching bumps and a touch of smudging along rear fold. A near fine copy. Schuster, Claud. Peaks and Pleasant Pastures. Oxford: Clarendon Press, 1911. [First edition]. Illustrated with several double-page maps. Denim blue cloth, ruled with gilt on boards, lettered on spine; cloth a touch bubbled at top; corners and spine ends lightly rubbed; institutional library bookplate and spine label; ink name and notation on front pastedown. A very good copy. Taylor, William C. The Snows of Yesteryear: J. Norman Collie, Mountaineer. Toronto; Montreal: Holt, Rinehart and Winston of Canada, 1973. First edition. Illustrated with maps and photographs. Original buff faux-burlap boards, titled in gilt on spine; slight hint of toning around edges. Photopictorial (Collie) dust jacket, now much creased and torn, and lacking a couple pieces at top edge. A near fine copy, in very good dust jacket, of this tale of one of the first great climbers and his ascents of some of the toughest peaks in the Canadian Rockies. [Vanity Fair prints]. Mountaineering. Updated as available. Viollet-Le-Duc, Eugène. Mont Blanc: A Treatise on its Geodesical and Geological Constitution ... London: Sampson Low, 1877. [First English language edition]. With 112 illustrations. Bright royal-blue cloth; black and gilt lettering and front cover decoration (mountain vignette) still sharp and bright; extremities very lightly worn. Private institutional library copy with small spine label, bookplate and rear pocket; internally tight and clean. Despite having been a library copy, a fine, bright, tight, copy, without the usual wear one might expect. One of Viollet-le-Duc's last books, this is a study of his observations of the structure and changes of the Swiss mountain. Clendenning, Iris. The History of the Montreal Polo Club, 1900-1940. Les Cèdres, Quebec: The author, 1987. [First edition]. Illustrated with numerous historical photographs, newspaper articles and caricatures. A fine copy in original gilt-lettered green cloth, contents clean and tight. Forbes, William Cameron. As to Polo. [Boston]: Dedham Country and Polo Club [and] Manila Polo Club, c1923. "Fifth edition." "Press of Geo. H. Ellis Co. (Inc.) Boston." Illustrated with 25 full page two-colour instructional diagrams at rear. Dark brown cloth, brightly ruled and lettered in gilt; very minor rubbing at spine ends; pages a bit age-toned. A near fine copy. First published 1911, from notes "...hastily thrown together in very busy days in the Philippine Islands in 1910 ...". Kendall, Paul Green. Polo Ponies: Their Training and Schooling. New York: Derrydale Press, 1933. [First edition]. "One of eight hundred and fifty copies ..." Illustrated with instructional photographs and diagrams. Original gilt decorated (rider and pony) denim blue cloth lightly sunned at edges and a bit darkened on spine; all gilt nice and bright, though a hint of rubbing to spine lettering; spine ends and corners rubbed, head lightly worn. Neat ink name and date on front endpaper; pages very lightly age-toned. Very good. Miller, Lieut.-Col. E.D. Modern Polo. London: Hurst and Blackett, [n.d., ca.1923]. "Fourth edition, revised and largely rewritten." Profusely illustrated with photographs of top players and their mounts, action shots, mallet types, and strategic diagrams. Original maroon cloth, now a bit soiled, gilt lettering bright on front, but bronzed on lightly sunned spine; corners bumped, spine ends and joints a touch rubbed. Text block cracked in places, yet holding firm; pp. 377- roughly opened. A very good copy. Clarence Swimming Club. Annual Dinner & Smoking Concert ... February 2nd, 1895. 4.25" x 5.5"; 4 pp. printed in red on off-white paper; decorative pale-peach embossed border with scalloped edge; very lightly soiled. Near fine. Sachs, Frank. The Complete Swimmer. London: Methuen & Co., 1912. First edition. "With 21 illustrations and 8 diagrams." Original blue cloth a bit dusty, lettered in blind on front and gilt on now lightly sunned spine; minor loss at one corner and tiny scuff at centre spine; two or three faint score lines to boards; spine ends creased. Edges lightly foxed, minorly so on some page margins; title page tanned where in contact with frontispiece tissue guard, other leaves lightly age-toned. Very good. Sinclair, Archibald and Henry, William. Swimming. London: Longmans, Green, and Co., 1893. Large paper edition, no. 69 of 250 copies. "With illustrations by S.T. Dadd and from photographs by G. Mitchell." Original ¾ mustard-orange cloth and dark-blue calf; gilt titling and decoration still nice and sharp, but rules at tail of now somewhat sunned spine rubbed; front cover lightly sunned around edges; cloth a bit dusty; calf rubbed at extremities. Bookplate; ink names and date on front fly; ribbon marker intact; contents a bit foxed, yet clean and tight. A near fine copy, without the usual heavy deterioration of the thinly pared calf. [Amusement Games]. The Frog Game. Brooklyn: Paramount Amusement Device Corp., [n.d.]. 4 pp. b/w decoratively ruled pictorial (the game) folder; horizontal folds; light dampstaining along top; dusty; some minor foxing; split at for edge along creases (longest ¾"). A very good copy of this elusive amusement park game marketing brochure. "The principal object of the game is, to inflate the throat to such a size as to cause one of the Frogs to suddenly throw open wide its mouth and sing ..."
[Field Hockey]. Burr, Hilda V. Field Hockey for Coaches and Players. New York: A.S. Barnes and Company, 1930. [First edition]. "Athletics for Women Series." Illustrated with diagrams and photographs. Original brick red cloth, lettered in white, spine now a touch rubbed, ends lightly creased. Contents clean and tight. laid in flyer for sports publisher (Sports Tips and Teaching Aids, Detroit), advertising Baseball and Softball Rules and Softball Tips, by Hubert G. Johnson; Tips on Field Hockey, by Mary Brockett; and Tips on Better Badminton, edited by Jackson and Swan. Original green flyer printed in black, with address label and postage stamps seals, now broken; a touch dusty. Both items near fine. [Field Hockey]. Concerning Lawn Tennis and Badminton. Smethwick, Staffs. [UK]: The Birmal Racket Dept., 1925. 1st edition. Includes a chapter on field hockey by Harry E. Haslam. [Field Hockey]. Cubberley, Hazel J. Field Hockey Analyzed: For Instructor and Player. New York: A.S. Barnes and Company, 1932. "Athletics for Women Series." Well illustrated with diagrams (line and photo) and instructional photographs (remember those awful jumpers?). Original dark green cloth, lettered and decorated (crossed sticks) in black; lower edge and spine ends very lightly rubbed. "1¢" ink stamp on front endpaper; small ink number on recto of rear endpapers, bleeding over to facing page; rear hinge starting yet strong; contents excellent. A fine copy. [Field Hockey]. Robson, Philip A. A Manual of Hockey. London: Methuen & Co., 1934. First edition. "With a Foreword by W.F. Smith ... With 9 Illustrations and 7 Plans and Diagrams" on four plates, the remainder in-text. A fine copy in black lettered grass-green cloth, bright and clean; minor foxing to fore edge; contents excellent. Near fine cream photopictorial (ancient and modern games) dust jacket printed in brown; "4/-" price sticker on spine; dusty overall, with a couple tiny ¼" closed tears, a bit of creasing at lower front, and light rubbing at folds and base of spine. Includes a 100+ item bibliography of the sport from the 14th to the 20th centuries. [Lawn Bowling] Burrows, George T. All About Bowls: With Hints for Beginners. London: Mills & Boon, 1915. [First edition]. "With contributions from past English champions, including D.I. Watson, J.S. Emmerson, J.G. Carruthers, F. Shatford, W. Taylor, J. Fingland, and Others. Illustrated with nine photographic plates, most of former champions. Publisher's steel-blue cloth, w/title and publisher's monogram on front, Jaques Bowls ad on rear stamped in black; just a touch dusty, with very minor bubbling at lower front. Ads on front endpapers, with neat ink name and date; bookseller's label on rear pastedown; light foxing to edges, contents clean and tight. A near fine copy. [Lawn Bowling]. Esch, Harold L. (comp. & ed.). Lawn Bowling Handbook. Wuwatosa, Wisconsin: [the author], 1948. [First edition]. With several diagrams, one photograph and three advertisements. Original plain green cloth, simply lettered in black on front; covers nice and clean. Ink gift inscription on front endpaper; endpapers toned. Near fine. A group of four letters concerning the discovery and description of a group of old bowling balls found in a house in Chevy Chase, Md., including two TLs by Esch; and one issue of Southeast Bowler newsletter (Vol.7, no.8, June 1958). All a bit age-toned, newsletter with light edge-wear. Very good. Esch was winner of eight US Open championships between 1958 and 1987 (singles, pairs and triples), and historian for the American Lawn Bowling Association. [Lawn Bowling. Ephemera]. The Paddington Bowling and Sports Club. Two items: London's Open Amateur Bowling Tournament ... Entry Form and [Notice and Agenda of] Annual General Meeting. London: The Club, 1937. Two A4 leaves, the former printed in brown with photo of the club at top and tear-off form below, the latter plainly printed in black. Both with horizontal folds; entry form with small ink cross-out; agenda with 1/2" edge tear with resultant crease along bottom edge. Near fine. Founded in 1905, the Club continues today as the Paddington Sports Club. [Roller Skating]. Burchell, H.P. (ed.). Spalding's Roller Skating Guide. London: The British Sports Publishing Co., 1909. [First edition]. "Spalding's Athletic Library, Group XIII. No. 35." Illustrated with poorly printed instructional photographs of well known skaters; with several pages of Spalding's ads (8 pp. Athletic Library at front, 19 pp. equipment at rear). Original dark blue and tan pictorial (Edwardian skaters) wrappers; now chipped at corners and spine, with 1.25" piece lacking at tail; covers creased, yet still quite attractive. Pages evenly age-toned, and lightly dusty; staples rusting, especially at split between pp.2 and 3 of front ads. A very good copy of this usually fragile item. [Roller Skating]. [Vanity Fair print]. Herbert Praed. "The Philanthropist". [Rope Spinning]. Pinkney, D.W. Rope Spinning. London: Herbert Jenkins, 1930. First edition. "With a special chapter on How to use the lariat by Don Potter." Illustrated with 16 photographic plates and 21 line drawings. Original green cloth lettered in dark green, sunned overall, especially on spine; spine ends lightly creased. Edges foxed; contents clean and tight. A very good copy. [Soccer or Association Football]. [Vanity Fair prints]. Lord Kinnaird. "Soccer".